Solve your storage problems with the most versatile Shelving System! Virtually unlimited choice or widths, depths and heights – to suit your space! Particle Board shelf fitswithin the stepped steel box beam. 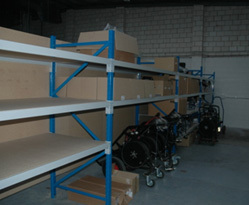 Size 2400mm high, 2400mm wide, 600mm deep with 5 shelf levels.